The Farm (back), with its farmhouse featuring blue windows at night. The Farm is a farm located in Flint County, near Easter Bay Airport, Easter Bay Chemicals, and Leafy Hollow. 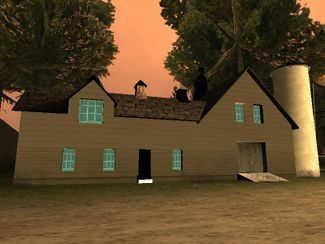 The Farm's farmhouse is notable for having glowing blue windows at night-time, a unique occurrence in all of San Andreas. There is speculation that this is related to the Epsilon Program. The mission Body Harvest has Carl Johnson steal a Combine Harvester from the farm for The Truth. This page was last modified on 15 March 2015, at 06:52.